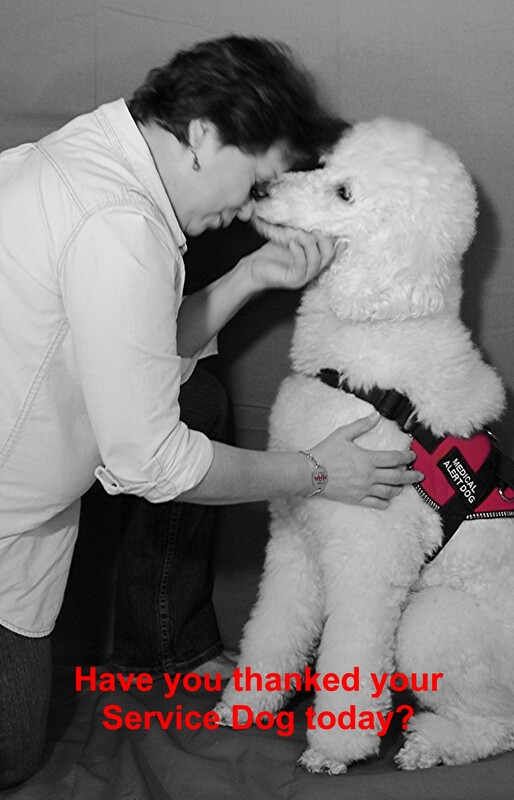 A1c Sugar Dog Events | Sugar Dogs International, Inc.
Lady walking her standard Sugar Dog! We encourage you to get out and take your Sugar Dog! Our local FL community relies on THE NEW BARKER, our official dog magazine, to get the word out on socialization events for dogs and their people. Please share your photos and events with them! Your Poodle can be Any Color! Get up and GO WALK YOUR DOG! Please keep your Sugar Dog’s health and vet visits current. Also, know that while you are out and about you are empowered to limit others “petting” your service dog. If they ask to pet, it is OK to say “No, Sugar Dog’s Name is a service dog and s/he’s working.” Generally, people ‘get it’ that it’s distracting to the dog. This is a nice time to have a Sugar Dogs International brochure or two in your pocket. And yes, sometimes, your Sugar Dog will alert to someone else while you are out and about. If you decide to share the alert with the other person, please be mindful of their privacy as to medical matters. If it happens and others are receptive, please give them a Sugar Dogs International brochure! Also available: personal training visit to your area is easily arranged. Please email us to plan for our lodging, dietary and transportation requirements. Also, Tampa General Hospital offers a 2-day class for diabetics and one caregiver. It is the BEST American Diabetic Association certified class of its kind in the USA. Its teaching team has won many awards. Looking for a great break? Fly to Tampa and take this course. It’s in a beautiful location, with hotels and great restaurants nearby. You need a prescription to participate. Please see the Archives Page to see where we’ve been. Paula suffered four (4) fractures in June 2016 (fib, tib, ankle and heel) and remained housebound for approximately 4 months until she was forced to sell her home and move in with her daughter’s family. Our activities were limited for approximately three (3) years as 2 surgeries, physical therapy, and doctors’ appointments became our social events. You are welcome to contact Paula by email and with any questions or concerns. March 30 and 31, 2019: Sycamore Lane Vintage Market, 3824 SW 170th St., Archer, FL (west of Gainesville, FL). This is an interesting event from 9 am to 4 pm. Paula and her Sugar Dogs will be visiting with Lucy (who sells the cutest vintage style aprons) and has invited us to join her. This is a dog friendly event. May 18, 2019: Paula and her Sugar Dogs hope to attend the Newberry Watermelon Festival in Newberry, FL. June 29, 2019: What to Bring: Picnic to Share, sunglasses, straw hats, lawn chairs, towels, swimsuits, sunscreen, flip flops, floaties, life preservers, tubes, snorkel gear, scuba gear, whatever floats your boat, including hula hoops, volleyballs, hula skirts, beach balls, basketballs, flower lei necklaces, mermaid tails, binoculars, Floridian shirts & shorts. What NOT to bring: NO alcohol. NO pets; service animals only & they strictly enforce cleaning up after service dogs. Smoking restricted to marked areas only. Camping is available and pets are allowed in the RV campground but not near the springs. June 29, 2019: This is currently a tentative event as the Suwannee River is out of its banks making the Hart Springs dark. Depending upon the summer rains, this event will cancel if the park is closed. Your donation funds important projects that will benefit Sugar Dog teams for years to come. When you support Sugar Dogs International, you’re investing in a staff of professionals who are deeply committed to our mission. You’re investing in an entrepreneurially oriented non-profit with a proven track record of successful initiatives. You’re investing in the future of Sugar Dog teams worldwide. 100% of the teams who follow our training method exactly have improved A1c lab results!!! Great results. It’s Sugar Dogs team work. Of course, you may note which Sugar Dog team benefits from your assistance. Please simply send an email.